Al Jefferson‘s second season with the Pacers reminds him of his first season with the now-defunct Bobcats four years ago. Neither team was expected to be in playoff contention, but 57 games into the 2017/18 campaign, the 32-25 Pacers – currently in sixth place in the Eastern Conference — are on track for the postseason. The Bobcats won just 28 total games in the two years before Jefferson signed a three-year, $40.5MM pact with Charlotte. Conversely, the Pacers began their post-Paul George era with reduced expectations and unanswered questions. Would Victor Oladipo and Domantas Sabonis be a sufficient return for George? Can a team without an established star compete in the East? Could young players like Myles Turner take a step forward? So far, the answer has been yes across the board. Jefferson has 14 years in the NBA and five trips to the postseason to his credit. This season, the 33-year-old has accepted the role of reserve center and mentor. He has appeared in just 28 games, averaging 6.5 PPG and 3.8 RPG in 13.6 minutes per game – all career-lows. The Pacers reportedly explored several trades at the deadline and Jefferson’s name was floated in discussions. Ultimately, the organization stood pat as the deadline passed. Jefferson and other Pacers players were happy that ownership allowed the current group to continue its playoff push. Pacers general manager Kevin Pritchard shared the sentiment. At the All-Star Game this weekend, the Pacers will be represented by Oladipo, who is just the second Pacer not named Paul George to make the team since 2011. Indiana has also played well against the NBA’s upper echelon, with wins over the Celtics, Spurs, and Cavaliers to the club’s credit. 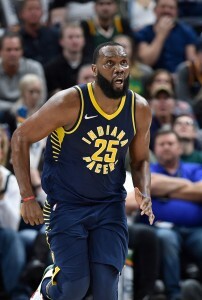 It will be a challenge to maintain their first-half level of play but Jefferson maintains the same confidence in the Pacers that Pritchard had when he decided to keep the band together. Second round playoff exit? Sure. Did you know on NBCSports.com your comment had 2 likes and 53 dislikes. You really are trolling. The Pacers put together a bunch of misfits, paid them what the league says they are supposed to pay them, and are only 2 games behind Cleveland with a salary Twice theirs. WE ARE PROUD OF THEM NO MATTER HOW THEY DO! THEY PLAY HARD! Oladipo said Westbrook taught him how he needed to work hard to be a stat in the league and he’s doing it. Your comment finished with 4 likes and 94 dislikes. Cmon man! Loved Big Al in Charlotte. Wish they never let him leave. This is a special group of guys and the fans appreciate it. Pritchard said last summer he wanted guys who didn’t quite work out in other cities, but had talent. Collison was in Indy before and they gave him a 2nd chance. All Bogdonovich wanted was a chance to start. OKC and Orlando gave up on Oladipo. OKC gave up on Sabonis. Pritchard said he absolutely wouldn’t overpay anybody and he didn’t. Six players went to Pritchard before the deadline and asked not to trade anybody and give them a chance to make the playoffs. These guys define the meaning of team players and the way Pritchards communicates with them deserves Executive of the Year. Jefferson might not play every game because of his age and his style of center is becoming extinct, but he’s a leader in the locker room and produces when he plays. Pacers are definitely exceeding preseason expectations and while I don’t think they are ECF bound, they definitely won’t be an easy-out in the playoffs. While the Eastern Conference this year is more competitive as a whole, they’re probably the team that one of the likely top 3 seeds (Boston, Toronto, Cleveland) don’t want to see in the first round. Good Karma. They traded legitimately, getting developing talent instead of tanking with draft picks.